It's a mitzvah to eat and drink heartily on Erev Yom Kippur. ...all who eat and drink on the 9th, and fast on the 10th, are considered by Scripture as if they had fasted on both the 9th and the 10th. The reason why eating on the ninth is considered so great a deed that it is equivalent to having fasted, is that by doing so, we show our joy that the time for our atonement has arrived; ...since we cannot partake of a festive meal on Yom Kippur, we do so on Erev Yom Kippur instead; ...[it] provides us with the physical strength needed on Yom Kippur to focus ourselves on prayer, supplication and reflection that will lead us to teshuvah. Rav Yehudah Richter says if we eat well (what is good for us and in proper amounts) and with proper intention and say all the brachot correctly and with intent, we can thereby make a tikun for all the sins we made with regard to eating for the entire past year. Please forgive me for any offense I've given to you over the past year. I promise it was purely unintentional and I'll try to do a better job this year. G'mar chatimah tovah and Chag Sameach! "Fear Should Motivate Us, Not Paralyze Us"
Jews have been making aliyah from love of the mitzvah yishuv ha'aretz for a very long time. I'm afraid that time is now coming to an end to be followed by a relatively short period of aliyah from fear. HKB"H prefers that we respond to Him from love, but He'll accept fear as a motivator if that's what it takes. A friend had this posted on their page from a friend of theirs who’s on Puerto Rico. Think it would be any different in most cities? “My family has lost everything. My uncle with stage 4 cancer is in so much pain and stuck in the hospital. However conditions in the island are far worse than we imagined and my greatest fear has been made reality. The chaos has begun. The mosquitos have multiplied like the plague. Dead livestock are all over the island including in whatever fresh water supplies they have. They’re telling us to rescue them and get them out of the island because they are scared for their lives. We’re talking about 3.5 million people on an island, with no food, no drinking water, no electricity, homes are gone. Family if you have the means to get your people out, do it. This is just the first week. Imagine the days and weeks to come. These are bad people doing bad things to our most vulnerable. Imagine a few weeks with no resources and the most vulnerable become desperate. Multiply this by the millions suffering in the wake of similar disasters in recent weeks - all over the globe. Whether due to storm, flood, or earthquake, the survivors are lacking the most basic supplies to sustain life - food, water, and sewage disposal. They are being plagued by insects, hungry packs of roaming animals, disease-infested and chemical-tainted water. There is no relief from the heat. The jobs disappeared into the rubble left behind. And to top it all off, they must contend with fellow human beings who are taking advantage of the situation for their own evil desires. This is not the end. It's just the beginning of greater horrors to come - worse disasters spread over a greater area and affecting even more people. Don't be like the obstinate people of Noah's day who refused to heed the warnings. Yalkut Reuveni: "...the depths will rise up and flood the world, and there will remain the Land of Israel, which will be like the Ark of Noah." Get on board the ark while you still can because one day not so far off, the door will close and HKB"H will seal it shut. Does the idea scare you? I hope it does. I hope the fear motivates you to do the right thing and does not paralyze you into immobility. Choose right. Choose life. And HKB"H will help! Anonymous - We Have Never Seen Anything Like This Before! Who Needs To Repent? And Who Can Forgive? Some well-meaning Jews who do not understand the depth of the depravity of Christianity and who accept what Christian-Zionists tell them at face value without listening to the subtext which is ever there with every word they speak, are hailing Tommy Waller's plea for forgiveness from the Jewish community as a "watershed event." "...My appeal is to my Christian brothers and sisters: Please stop any missionary attempt to take away Jewish identity from those whom God chose to carry His name." In fact, Tommy Waller is trying to walk a fine line which is really two parallel lines. When he is with Jews, he's on one line and when he speaks to Christians he's on the other. He's not going to be able to keep this up forever. At some point he'll have to make a choice or the choice will be made for him. Already, he was forced to come out with this video because of negative feedback from the Jewish side. But, all this kind of thing does is bring concomitant negative feedback from the Christian side. I Don't agree with you in this matter. The Jews need to be saved as also the Gentiles need to be saved. All humans must Come in God's Kingdom through Yeschua Hamaschiach. My statement in the video was not about who is saved and who is not saved. ...My statement is about repentance. Tommy has become a master of the word games missionaries play with Jews to keep them unsuspecting. Back in May, I shared a letter written by one of the HaYovel volunteers which demonstrates this nicely. In the course of our conversation, I asked him: “If a Jew were to come before you and ask you whether it is better to be a Jew or a Christian what would you tell him?” He responded: “I would tell him to be a Jew!” Tommy added that he had not always thought this way. Originally, like other Christians, he was interested in everyone becoming Christian, but eventually he realized that this earlier position was the result of ignorance. Now, following his exposure to the Jewish renaissance in the Land of Israel, he wishes for all Jews to observe the Torah and mitzvot. ...I want to be careful to not put words into Mr. Tommy's mouth, but I can tell you how I understand this comment. It has a lot to do with definitions. To a Jewish mind, to become a Christian is to reject the majority of God's word. Anything that is clearly Jewish in observance is rejected - the Shabbat, the Holy days, eating kosher, etc. In the past (as I mentioned before) during times of persecution, when Jewish people did convert to Christianity under force, they were not allowed to do those things under threat of death. They still understand that to be "Christianity" today. They don't understand yet that someone can live a life as an observant Jew and believe that Yeshua (Jesus) is the Messiah. I understand Mr. Tommy's quote here to mean that he would never encourage a Jewish person to leave his Scriptural lifestyle, his observance of the Bible, (as they understand it) to become a "Christian" who leaves behind his love and obedience of God's word. I say again that Tommy Waller's well-publicized plea to the Jewish community for forgiveness is nothing more than a recently-invented ploy to be used as an evangelism tool. In addition to the loss of Jewish identity, Christians are being told that past antisemitic actions by Christians is one of the stumbling blocks to Jews coming to faith in Yeshu. Ergo, this silly, unBiblical (for Jews OR Christians) public proclamation of repentance on behalf of past generations and the seeking of forgiveness by present-day Jews on behalf of past generations of Jews. Both actions require the exercise of will from the parties involved. Neither repentance nor forgiveness can be given on behalf of another. (Excerpt) Grant Berry - Below is the prayer that Pastor Glenn Harvison wrote for himself and the church that he pastors. As he read it to me, all I could do was weep. My response and prayers of forgiveness on behalf of the Jewish people to the church are on the video. Grant, in the presence of God, I would like to address you as a representative of the Jewish people, and as a representative of Jewish believers in Y'shua. I speak, today, representing myself, representing my present family and representing the past generations of my family. In the presence of God, I want to confess my sins, and the sins of my family, in the area of racism and especially anti-Semitism. I ask God for His forgiveness, and I humbly ask for your forgiveness, on behalf of the Jewish people, for any and every anti-Semitic prejudice, thought, word, gesture and deed on my part, and on part of the members of my family, present and past. I ask God for His forgiveness, and I humbly ask you for your forgiveness, on behalf of the Jewish people, for any and every failure to show the love and dignity due to the Jewish people as fellow human beings, and, especially, as God's beloved covenant people. It goes on, but you get the idea. Sound familiar? Sounds a lot like what Tommy Waller just released via youtube, facebook, JPost and BIN (may they be accursed along with any other Jew collaborating with Christians). Would you as a Christian, want to be associated, much less believe in such a person – in whose name, such grievous acts were done? The sad reality is that Christians have done all of the above and much worse to our Jewish brothers and sisters for close to 2000 years, and all in the name of Christ. ...an even more grievous act has been done to our Jewish brethren by Christians. And that is the stealing of the Jewish Messiah-Yeshua (the real Hebrew name of Jesus) and disfiguring Him and His teachings, so that no Jew would even want to know about Him. Which brings us to the re-Judaization of Yeshu along with his Hebrew apellation and the re-identification of Christianity with its so-called Hebrew roots. It's all about claiming Jewish souls for Yeshu. As long as there is a Christianity, Jewish souls will be sought for Chr*st. As long as Jews don't fall for their tricks, they won't succeed. I regret that the subject of the first post of the new year will be Tommy Waller, but evil doesn't take holidays. In fact, it seems to ramp up around the holidays. Even now, Xians are pouring into Israel for "The Feast", as they do every year at this time, and all of them are looking for a weak place through the Jewish armor to reach the Jewish soul and steal it for Yeshu. A few people have asked my opinion about the new video of Tommy Waller calling on his fellow Xians to renounce "replacement theology." Sadly, I must tell you that absolutely nothing has changed here. Since the beginning of their ministry, the Wallers have said that they do not want Jews to become "Xians," i.e., give up Jewish practice and ritual, but they do want them to be "messianic" Jews, i.e. believers in Yeshu (without giving up Jewish ritual). Giving up replacement theology simply means agreeing that Jews, as Jews who believe in Yeshu and go to "synagogue" instead of church, ALSO have a place alongside the rest of Christendom. This is just a last, sad and bad attempt on the part of Xians to reel in the Jewish fish by trying to convince them that they can live on the land and yet remain fish. In the past, a Jew who believed Yeshu was the messiah had to convert to another religion, leave the synagogue forever and go to church. As a demonstration of his sincerity, he was required to eat a ham sandwich. Why? Because, according to the Xians of those times, God was through with the Jews and had a new people known as the church. If a Jew wanted to be counted as part of God's people he had to give up on being a Jew and become a Xian. What Tommy Waller and his fellow "Israel-loving" Xians claim to have suddenly discovered is that a Jew can remain a Jew and still come to faith in their Yeshu, who is also reclaiming his Jewishness in these latter days. They still believe that only those who put their faith and hope in Yeshu will be redeemed, but it includes both those who identify as Jewish as well as those who identify as Xian. The two are "one new man" with their shared belief in Yeshu and together they are equal heirs of the promises made to the forefathers: Avraham, Yitzchak and Ya'aqov. Tommy's little speech is absolutely nothing new. It's the same thing Jews for Jesus has been saying for the past fifty years. This is just another misguided attempt to convince Jews to take another look at Yeshu, to present him and his message in a more acceptable light. Your problem is - you are still wrong. Yeshu was NOT a good Jew. He was NOT god. He was a man who sinned and died for his own sins. He saved no one, not then, not now and not ever. He never was and never will be the Messiah. There is some perverseness in the hearts of Xians who can come so close to the truth and yet fail to recognize it and embrace it. Your judgment and consequently, your punishment, will be especially severe. I urge you to consider the possibility that you could be mistaken. That is your first step towards real salvation. It takes effort to stay focused on the main idea of this holiday. HKB"H has the right to sit in judgment of His creations on this day because He is the King of all. When we truly recognize that inescapable fact, we will repent completely because all of our sins are just rebellion against His sovereignty. On Rosh Hashanah we submit ourselves to HKB"H's sovereignty over our lives and our destiny. We repent of our rebellions and renew our loyalty and faithfulness to carry out His will. G-d is the incomparable King of The Universe. The destiny of humanity is to come to this realization. Whereas human kings rule in accordance with the principle of :”might makes right,” G-d is the Holy King, Who is, at the same time, beyond comparison in His power, “Vas er vil, Tut er” – “Whatever He wills, He can do,” yet He is also the Father of the orphan and the Judge of the widow, Who is always on the side of the powerless. He is the Incorruptible and Righteous Judge of the World, Who favors no one, and cannot be bribed. He is the true G-d and His word, the Torah, is true and eternal. We recognize that Hashem is above Time, and the idea of “forgetting” does not apply to Him, nor is He limited in “understanding” the inner thoughts of His creatures. Nevertheless, we ask that He “remember” only the “good” in our behalf when He Judges us. For all of humanity, for the whole world is Judged today, we ask that He “remember” the faith of Noach who endured taunts and threats for 120 years while he built the Ark, and tried to explain its purpose to his wayward generation. Most of all, we ask that He “remember” the supreme act of devotion performed by our fathers Avraham and Yitzchak, where Avraham suppressed his natural feelings of mercy towards his son, and was prepared to sacrifice him at the command of G-d, and Yitzchak was prepared to be sacrificed, thereby suppressing his natural feelings of self-preservation, in fulfillment of G-d’s command. So should G-d suppress, so to speak, His Midat HaDin, His Attribute of Strict Justice, which would require that we be punished for our misdeeds, in favor of His Midat HaRachamim, His Attribute of Mercy. We recall the time that G-d revealed Himself on Mt. Sinai and gave us the Torah. The Shofar will be blown during the final battles of Israel with its enemies. It will be sounded when our Exiles return. It will be sounded when the Temple will be rebuilt. It is the sound signifying the Presence of the majesty of G-d.
We ask that it be sounded again with the arrival of the Mashiach. AMEN!! May the Holy One, blessed be He, be merciful to us and grant us forgiveness for all our transgressions and bless us with an eternal salvation in the coming new year 5778! ...even the illusion of Israel being "The Jewish State" will no longer exist. Israel will be nothing more than the 51st State of the United States of America! Religion and State Index finds 86% of Israeli Jews believe state should ensure freedom of religion and conscience for all of its citizens, while 65% call for equal rights and recognition to non-Orthodox Jews; 82% think ultra-Orthodox schools must be require to teach core curriculum subjects, while 36% call to conscript all yeshiva students. ...Support for a separation of church and state is on a constant rise, jumping from 56 percent in 2012 to 68% in 2017. There's the "two-thirds" who won't make it! “This is the first time that we have an American flag flying in an IDF base." How is this base different from the eight other US bases in Israel? The fact that they are publicly acknowledging it? And while we're at it, why is this in Jerusalem??? 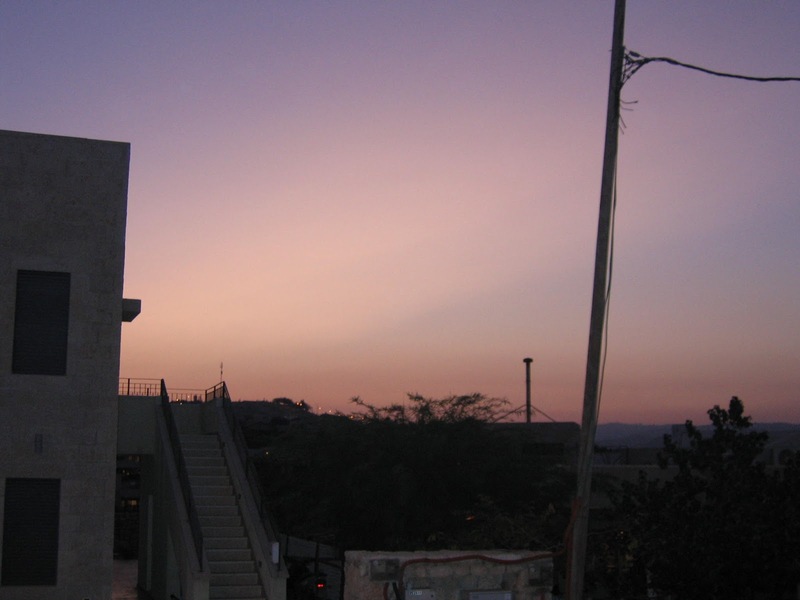 Yesterday, shortly before havdalah, we noticed the post-sunset sky had a strange glow to it and was a weird yellowish color long after the sun had gone. Today, it's electric orange and glowing red. Anybody else notice it? I've never seen anything like it. The pictures really don't do it justice. This is looking towards Jerusalem. And this is what it looks like from my house today. Strangely, almost no color at all. Space Weather Has Become Stormy, Too! The biggest solar flare seen for 12 years erupted from the sun earlier this week, causing radio blackouts on Earth. Two high-intensity solar flares were emitted, the second of which was the most intense recorded since 2005, the Space Weather Prediction Centre (SWPC) said. Now, NASA has revealed the storms are continuing, with what the space agency says is a ‘mid-level solar flare’ that peaked at 3:49 a.m. EDT today. This is the sixth sizable flare from the same active region since Sept. 4, NASA said. The earlier flares knocked out radio communications for one hour on the Earth’s side facing the sun, as well as low-frequency communications used in navigation. Stormy conditions may be back in time for Yom Kippur. "The last Shabbat of 5777 - the last haftarah of consolation..."
SHABBAT SHALOM and SHANAH TOVAH! The term "Orthodox" has become meaningless. Leaving Eretz Yisrael to go abroad to rebuild avodah zarah?!!!! ...ZAKA Chairman Yehuda Meshi-Zahav, says he is proud of the hard, physical work his volunteers are performing for everyone in need in Houston. “Our sages tell us that God created man in his image. Not just Jews, but all men,” he added in a statement. To add insult to injury, Evangelical "Pastor" Becky Keenan is particularly keen on evangelizing Jews in Israel. "...With an upraised hand (Harvey) and with an outstretched arm (Irma) and with poured out fury (Jose?)." Clearly, HKB"H is waiting to see if real teshuvah is going to come out of the first two before letting loose with the third one. After Irma, are we going to get clobbered by Hurricane Jose next? While all eyes in South Florida are fixed on the coconuts and construction cranes being flung about by Hurricane Irma, her not-so-little brother Jose is capering about in the Atlantic north of Puerto Rico, doing some kind of weird spinning in a circle fandango that current forecasts say could leave the storm pointed right at South Florida at the end of the week. Like Irma, Jose is a major storm, with 130 mile-per-hour winds. At the moment, it's about 1,000 miles east-southeast of Miami, and an entirely schizophrenic attitude about where it wants to go. When all this back-and-forth ends on Friday, the center expects Jose to be sitting about 600 miles away, facing Miami. But where it goes from there, at least right now, is pretty much anybody's guess. "And I shall take you out of the peoples, and I shall gather you from the lands in which you were scattered, with a strong hand and with an outstretched arm and with poured out fury." "What Does NOT Prevent Redemption..."
THIS IS THE NEXT INSTALLMENT. Phenomenal!! "In Its Time, I Will Hasten It"
A military drill unprecedented in its size and scope began day before yesterday in Israel's north and is purportedly scheduled to end next Thursday which is 23rd Elul. That date is significant because it was the Hebrew date on September 11, 2001. In light of this morning's news of an aerial attack on a Syrian weapons facility, one must consider whether this is the "sudden small attack" referenced below. Tens of thousands of soldiers as well as ships and aircraft will take part in 10-day exercise from Tuesday; army says timing unconnected to current Iran tensions. ...The exercise will simulate a conflict with Hezbollah that starts with a sudden, small attack and develops into full-scale war. ...In addition, the IDF Home Front Command will practice its “Safe Distance” plan, in which civilian populations along the Lebanese border will be evacuated farther south in order to keep them out of harm’s way, as the military believes that in a future conflict Hezbollah would try to send fighters to attack northern Israeli communities and their inhabitants. “The decision to carry out the transfer of communities will be made at the political level, with the intention of preserving the safety of the citizens of the State of Israel,” the military official said. The officer would not specify which communities would be evacuated during the exercise. It occurs to me that our government takes no action without first obtaining permission from TPTB. What if they have given Netanyahu the green light with the expectation that they will back him up, but it's just a trap to draw us in and then abandon us to our fate? Completely according to HKB"H's plan, of course. The Sun Threw A Fit Today! ...If it stays on track and reaches the Florida Straits, the water there is warm enough that the already “intense” storm could become much worse with wind speeds potentially reaching 225 mph, warned Kerry Emanuel, an MIT meteorology professor. “People who are living there (the Florida Keys) or have property there are very scared, and they should be,” Emanuel said. ...“Puerto Rico has not seen a hurricane of this magnitude in almost 100 years,” Carlos Anselmi, a National Weather Service meteorologist in San Juan, told The Associated Press. Authorities warned that the storm could dump up to 12 inches (31 centimeters) of rain, cause landslides and flash floods and generate waves of up to 23 feet (7 meters). Government officials began evacuations and urged people to finalize all preparations as shelves emptied out across islands including Puerto Rico. "The Six Obstacles to Teshuvah"